through the SSC website, Fill the application form and submit with necessary documents before 04-August-2017. The vacancies available in SSC Recruitment are 1102 posts. 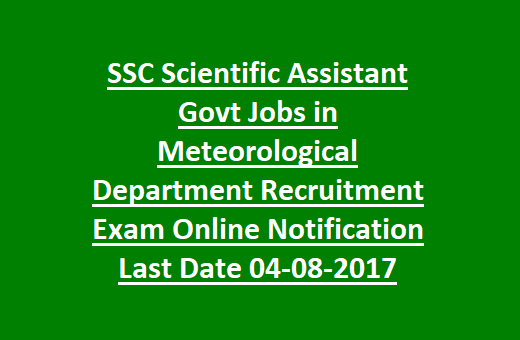 SSC Recruitment of Scientific Assistants jobs selection is based on Computer Based Examination, which will be conducted from 20-11-2017 to 27-11-2017. Selected candidates will be offered monthly pay scale of Rs. 9300/- to Rs. 34,800/- plus GP of Rs.4200/-. Applicants must hold Bachelor’s Degree in Science/ Computer Science/ Computer Applications/ Information Technology (OR) Diploma in Electronics & Telecommunication Engineering qualification. Full details regarding Staff Selection Commission SSC Recruitment of Scientific Assistants jobs notification are given below. Vacancies available in Staff Selection Commission SSC Recruitment are 1102 posts. Post Name: Scientific Assistant (Group B): 1102 posts. Pay Matrix for Scientific Assistant posts is Rs. 9300/- to Rs. 34,800/- plus GP of Rs. 4200/-. Candidate age should not exceed 30 years as on 04/August/2017. Upper age relaxation permissible for SC/ ST candidates is 05 years, for OBC 03 years and 10 years for PH candidates. Diploma in Electronics & Telecommunication Engineering from any recognized University/ Institution. Computer Based Exam will be conducted for the recruitment of Scientific Assistants vacancies. Computer Based Examination will be conducted for 200 marks, and will comprises of 200 questions. The exam duration is 2hrs. The Question paper consists of two papers. Physics, Electronics & Telecommunication, Computer Science & Information Technology: 100 questions. Examination Centres are given in the SSC Notification. For each wrong answer 0.25 marks Negative marking is there. Computer Based Exam will be held from 20-11-2017 to 27-11-2017. Application forms available from 18/July/2017 at SSC Official Website www.ssconline.nic.in. Eligible candidates fill the application with Registration ID and Password which is provided at the time of registration process. Last date to submit application form with photograph/ Signature before 04-August-2017. For General/ OBC candidates application fee is Rs.100/- paid through SBI Challan/ Net Banking/ Credit card/ Debit card. Fee exempted for Scheduled caste/ Scheduled Tribe/ Physically Handicapped candidates.